"Race to Witch Mountain" is actually a remake of the movie, “Escape to Witch Mountain” that was shown in the 70s. Disney definitely saw something in the original UFO-themed film that is worth a remake. We didn’t get to see the Disney original movie but we basically expect it to be good since Disney decided to revive it again in the theaters. 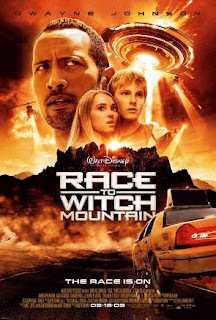 Is "Race to Witch Mountain" worth the watch the second time around (especially for those who loved the classic version) or wou ld we wish that Disney just didn’t bother? "Race to Witch Mountain" circles around the life of Jack Bruno (Dwayne "The Rock" Johnson), an ex-convict who is now living a quiet life as a cab driver in Vegas. He encounters two teenager passengers who turn out to have extraordinary powers. These two kids are actually from outer space, coming to Earth on a mission to help save the planet from destruction. Their own aline military is planning to conquer our planet and they now need to look for their spaceship in order to return to their planet and stop their military before it is too late. Jack vows to help them, and he is joined by a UFO investigator, Dr. Alex Friedman. Our say about this one? Sorry to disappoint Disney fans but it is definitely a waste of time! The story is just too cliché – it would definitely be good 30 years ago but not at this day and age. Our generation has just seen too many alien flicks that have more original and better stories. Another is that the writers definitely didn’t give much effort as the lines weren’t funny, witty, or original. Although it is supposed to be comedy that the whole family would enjoy, we could have sworn the whole movie house just laughed once or twice at the lines. The visual effects weren’t even that great! We just wished Disney just came up with a brand new movie – take our word for it, stay away from this one.